Paranormal Pop Culture: Animal Planet's 'River Monsters' finds Loch Ness Monster and it is a ... shark? Animal Planet's 'River Monsters' finds Loch Ness Monster and it is a ... shark? If you think shows about fishing are boring and have nothing to do with cryptozoology, well, you would be Animal Planet has kept audiences on the edge of their seats as they journey with Jeremy Wade into mysterious places in search of fresh water nightmares on River Monsters. On May 26, Wade went after the most well known river monster of them all; the Loch Ness Monster. Probably the most (in)famous cryptid in history, Nessie has been much debated since the early 1930s, with sightings and reports dating all the way back to the 6th century (sorta). Countless theories as to what the monster is (Dinosaur? Giant eel? Elephant? ), numerous "eyewitness" accounts, decades of searching and even a museum later, Animal Planet may finally have an answer for us. 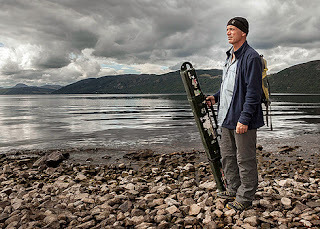 Imagine the surprise of the audience when Wade's search lead him to Norway to hunt down a ... shark?! The most common theory has been that Nessie is a prehistoric beast; a Pleisiosaur to be exact. The only issue with that is that there are many actual scientific facts that debunk that theory outright. However, the Greenland shark, according to Wade, fits the bill for the legendary Nessie. It is slow moving, hunts and inhabits extremely deep waters, has a small dorsal fin, rarely surfaces and can grow to be over 20 feet in length. Wade himself said, "You wouldn’t actually think it was a shark -- you wouldn’t know what it was; it’s got this sort of upturned boat hull appearance," which kind of holds water with all of the reported sightings in the Loch. While the Greenland shark proves no danger to humans, all other animals had better watch out if they fall asleep nearby or stumble upon one because, according to the Discovery Channel, "If something looks like food ... this shark will gobble it down." Could Jeremy Wade have finally found the legendary Loch Ness monster? It seems likely, however that won't stop the Loch Ness enthusiasts from searching for evidence to support their own theories. We here at Paranormal Pop Culture encourage all you cryptozoologists, aspiring or otherwise, to follow your dreams and keep at it, because we too, want to believe.